Availailable in: Pearl White, French Vanilla, Powder Blue, Hunter Green, Burgundy Wine, Dove Grey, Soft Mint, Blush Rose, Espresso and Green Tea. 350 Thread Count 100% Cotton. A luxurious 100% Cotton fabric. Soft and Comfortable. 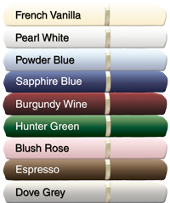 Available in: Satin White, Champagne Mist, Antique Sage, Light Blue. 600 Thread Count 100% Cotton. The Ultimate Bed Linen to pamper yourself. Available in Creme Brulee or Dove White. A beautiful, soft, durable, wrinkle free fabric. Luxury linen with a soft crisp finish. Available in many decorator colors. Satin trim optional on top sheet and pillow cases. Indulge in this soft luxurious cotton fabric that is soft and rich to touch. Top sheet and pillow cases finished with matching satin ribbon trim. Available in several rich, beautiful colors. Wrap yourself in luxury with our exquisite fabric of 100% Egyptian Cotton. Available in Créme Brulée, Dove White Blue Sky and Tuscan Sand. Top sheet and pillow cases embellished with a coordinating satin ribbon.